If the thought of staying in commercialized Manali town (New Manali) doesn't appeal to you, head a few kilometers uphill to the village of Old Manali. Surrounded by apple orchards and populated by rustic local homes, it's frequented by foreign travelers, backpackers and cosmopolitan young Indians. The mood is chilled and the accommodations are inexpensive, with a multitude of new hostels opening up in the last couple of years. These cheap budget guesthouses and hostels are among the best places to stay away from the crowd in Manali. When it's not busy, prices are often negotiable! If you're planning a trip to Manali, also have a read of this helpful Manali Travel Guide. Orchards House - the Hidden Tribe guesthouse is ideal for travelers who want a social, community vibe without staying in a backpacker hostel. It's tucked away amid apple and cherry orchards in the center of Old Manali, about five minutes walk from the main road. The route will take you past village homes, animals, and locals going about their daily activities. The property is set up really well with lush garden and communal spaces to hang out in, shared balconies, a kitchen that guests can use, an in-house cook, beers, and a wide range of rooms to suit everyone. These include a dormitory, family apartments, triple rooms, double rooms, and single rooms. Colorful art adds to the bohemian feel, and the young manager is extra helpful. What more could you want? Rates range from around 625 rupees to 3,000 rupees per night. Like solitude rather than being social, and don't mind splurging a bit? The Dog on the Hill is a boutique homestay in the same area as Orchards House. It provides a quiet and creative retreat for guests who are looking for a local experience with modern comforts amid nature. The hosts are interesting people who have succeeded in leaving city life for the hills, and their home has been artfully decorated with interiors inspired by their travels and local culture. The four guest rooms are located inside the home but have a separate entrance. As the property's name implies, two dogs (sweet cocker spaniels) live there and the hosts encourage guests to bring their pets too. Adventure travelers will also appreciate this property. The hosts offer guided walks, hikes, rock climbing and other mountaineering-related activities. Expect to pay about 2,500 rupees per night for a double room. Love good food? Terry's Bed and Breakfast opened in March 2015, right in front of the river in Old Manali, and quickly established a reputation for its meals. The owner, Terence Sequeira, is a passionate chef who specializes in authentic Goan cuisine with a twist. Organic salads, pastas, burgers, and sandwiches are also on the menu at Terry's Garden Cafe. There are six guest rooms, all with river views. The sound of the rushing water is so soothing. It's guaranteed, you won't want to leave! Expect to pay 2,000 rupees per night for a double. The laid-back Red House sits near the bottom of Old Manali, opposite the Club House. It's owned by two welcoming guys who aim to provide a place where travelers can relax and enjoy themselves. They serve great food, offer helpful recommendations, and hold entertaining evening bonfires with music jam sessions. There are private double rooms with mountain views (1,000 rupees per night) as well as beds in dorm rooms (300 rupees per night). Image from Bhoomi Holiday Homes. A great bargain in Old Manali, Bhoomi Holiday Home is perfect for travelers who want a clean and comfortable, yet friendly no-frills stay. 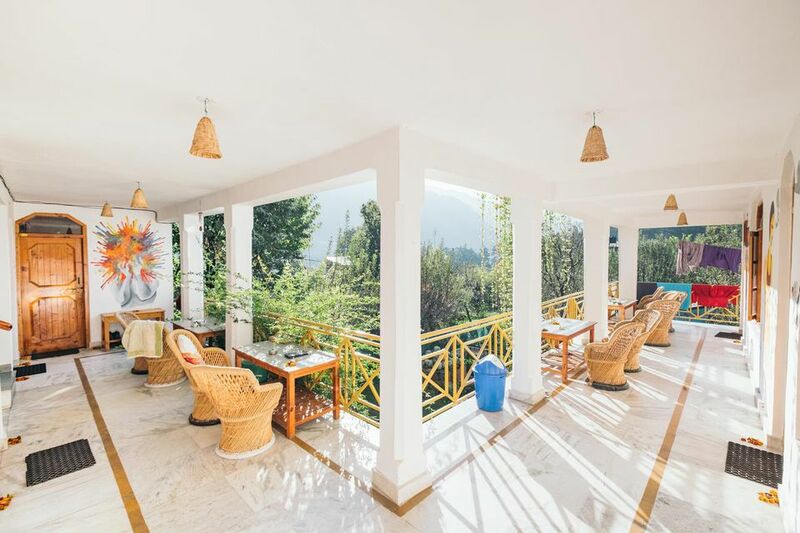 Newly opened in mid 2015, it has 12 guest rooms in the interior of Old Manali. It's situated off the main road towards Manu Temple and down a track past a few cow sheds. You'll need to walk about 10 minutes to get there. The property has a communal kitchen, and various accommodations from dorm beds to deluxe double rooms with private balconies. Rates range from around 300 rupees to 2,000 rupees per night. For a stupendous view across Old Manali, you can't get much better than 1000 Miles House at the top of hill near Manu Temple. This funky guesthouse is new on the scene in 2018. It has impressed travelers with its hospitality, food, ambience, and of course the view! The chef, who is also the owner, serves up a tempting array of dishes in the cafe including pizza and vegetarian options. Double and family sized rooms, priced under 1,000 rupees per night, are available. Situated near the Club House at the bottom of Old Manali, Eagle Guesthouse is bright and cheerful. It's run by a young husband and wife team -- he's Indian and she's Israeli. They have two children and a dog, which provides a warm family atmosphere. Indian, Chinese and Israeli cuisine is served. Travel services, including bike hire and tour bookings, are offered as well. There are eight double rooms priced around 1,500 rupees per night. Read reviews of Eagle Guesthouse on Tripadvisor here. A step up from the usual backpacker's hostel, in many ways Zostel Manali is more like a hotel. It's undoubtedly one of the Zostel chain's best hostels in India, in terms of stay and service. As well as the usual dorm rooms, it has luxury private double rooms with stunning mountain views and groovy garden cafe. The location is off the main road, near Bhoomi Holiday Home. The hostel also has its own dogs and is pet-friendly. There are both mixed and female-only dorms. Expect to pay 2,000 rupees per night for a private room, and 499 rupees for a bed in a dorm room. One Light Hostel is another popular hostel that's situated in the interior of Old Manali close to Zostel, with farms all around. However, what sets it apart is that its dorm rooms only have three beds in each and their own bathrooms, which is appealing for those who don't want to share a room with lots of people. Alternatively, guests can choose to stay in a tent in the garden when the weather is suitable. There's also an in-house cafe that serves tasty vegan food. Dorm beds cost from 200 rupees per night and double rooms with private bathrooms cost 800 rupees per night. This hostel is one of the cheapest places to stay in Old Manali. Moustache has an excellent reputation as a chain of boutique backpacker hostels in India. Their Manali hostel opened in mid 2018 and is no exception. It's situated at the bottom of the hill, right in front of the bridge when entering at Old Manali, and is blessed with the sound of the flowing river. It's a really convenient location to stay in, as there are many cafes in the area plus transport to Manali town. The rooms are pristine and super comfortable. Various activities are offered, such as chai classes, treks, games nights and bonfire nights. Or, simply read a book from the in-house library. A bed in a dorm room costs from 275 rupees per night and a private double room is from 899 rupees per night. Female travelers particularly like this hostel and feel safe in the female-only dorm. If you'd prefer to stay at a backpacker hostel at the top of the hill, away from the hustle and bustle, Bros is a good option. This new hostel opened in 2017 right near Manu Temple. The name conjures up feelings of camaraderie and you won't be disappointed. The property is a harmonious yet happening place, run by a happy young couple who go out of their way to spread positive vibes and look after guests. It's decorated with cool art, which is also uplifting. The food in the rooftop cafe is delicious and the outstanding view a bonus. Expect to pay 400 rupees per night for a bed in a mixed dorm room and 1,299 rupees for a spacious private double room with kitchenette facilities. Rockway is an adventure and trekking themed backpacker's hostel. Even reaching it is a bit of an adventure, as it requires a 10 minute trek along a forest path from People Cafe on the main road in Old Manali. If you want to stay in seclusion, you'll love the wild location through. The hostel borders the Mansalu River and gets its name from the fact that it's on the way to the famous Old Manali Rock. It aims to attract travelers who are the right combination of "peace and party". There's a common room, games room and cafe to hang out in. Plus, 12 guest rooms, which are a mix of mixed dorms and private rooms (including a family room). Rates range from around 300 rupees to 1,500 rupees per night. If Rockway is full, try Vatika Hostel next door. It has tents, as well as dorms and private rooms.